This will be the first Thanksgiving I've ever spent away from family. I really couldn't take another round of traveling on the worst travel day of the year. And although I'm looking forward to a jolly, boozy holiday with my friends, in the back of the mind I will miss gorging myself on turkey in close proximity to the people with whom I share genetic material. But that's exactly why I'm glad FaceTime exists. There's a joke we all make about FaceTiming or Skyping into to an event you can't attend. A college buddy's wedding in Columbia, Missouri? Skype your way to a prime seat on the bride's side. Mother's day brunch at your Aunt Kathy's house in Ft. Worth? FaceTime all the way down the delicious buffet. But it's one of those jokes that has a ton of truth to it, especially with the bajillion different ways you can video chat now. It's a technology that you should use liberally and casually, if you don't already. Holidays are prime time for FaceTime. Thanksgiving is less than a week away, and if you can't make it to a family shindig—and are bummed about it rather than being excited—here's your friendly reminder that you can at least feel close. Talking on the phone is one thing. But being able to see familiar faces and familiar expressions, and how your mother has immaculately set the table, and what adorable get-up your sister-in-law has decked out your infant nephew—that's something else entirely. You might not be able to be there in the flesh, but seeing your nearest and dearest, even through a screen, is the next best thing. Google likes to try to sell this to you in a cloying, saccharine ad about how Hangouts change lives that play over a Mumford and Sons song just dripping in sentimentality. We loooove to poke fun at those mawkish, overplayed tech commercials that are nearly interchangeable. But in this case, and particuarly at holidays, the need for connection is very real, and you're allowed to be a little more sentimental than usual. But the pro-FaceTime movement should not stop at holidays. I don't know when the scales tipped, but recently, I started FaceTiming—and video-chatting in general—more than just occasionally, but on a regular basis. Of course, when FaceTime first debuted on the iPhone 4, it was very limited: you had to be on Wi-Fi and you had to be chatting with another iPhone 4. Translation: nobody ever, ever used it. But now that you can FaceTime over data and with other Apple devices, and it's become more of a universal thing. I'll FaceTime you later and show you, has suddenly become a regular part of my conversations, and you should try making it a bigger part of your vocabulary too. Or I'll Skype you. Or Let's Hangout. OK maybe reword that last one. Granted, it might be a personal thing. I live thousands of miles away from some of the people I'm closest to. One of my best friends just moved from New York to San Francisco, where a colony of my other cronies live. I also have a contingency of cohorts in Houston, and a smattering across the midwest, not to mention family in Dallas and Atlanta. 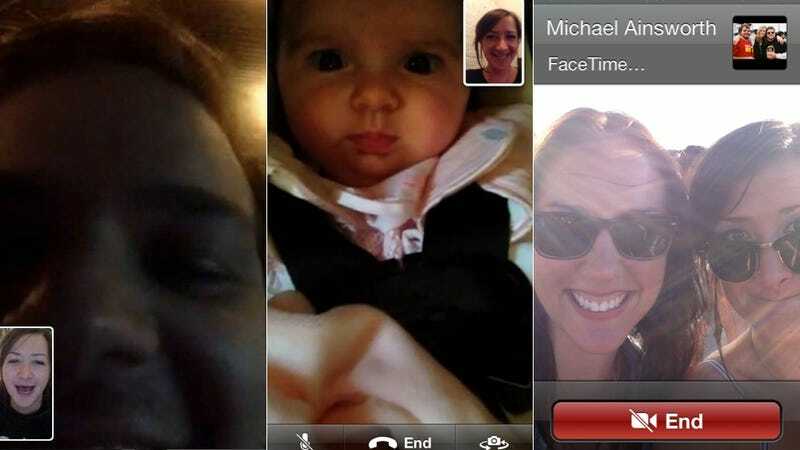 In a way, there's a domino effect—once you start video chatting, everyone else will follow suit. At least that's been the case with my tribe. My high school newspaper teacher, Mrs. Hall-Chiles used to pound the idea of "showing not telling" into our little teen heads. And while that certainly applies to writing, it's also applicable to life in general. There is power in being able to show. On the flip side, there is power in being able to see. You might not be on this train yet. You might think FaceTiming is weird. Well it is weird. I have one friend who will FaceTime me at odd hours just to catch me off guard. But there is this vital sort of realness that bubbles up when you can look at someone in the eye—err, the camera, or the screen, or in their general direction. That feeling just isn't as potent if you're simply talking it up. So enjoy that realness and closeness and awkwardness next Thursday—and beyond.